Come and say hi at Melksham Comic Con – this Saturday…. Saturday 31 August sees Disconnected Press returning to Melksham Comic Con. The convention will run through the day from 10.30am at Melksham Assembly Hall, Market Place, Melksham – here’s a handy map. It’s a double day of delight for Disconnected Press. Writer and editor Lizzie Boyle will be speaking in a panel on Women In Comics alongside Britain’s only female comic shop owner, Hayley Spencer of Komix, and Marvel writer Simon Spurrier (err…). 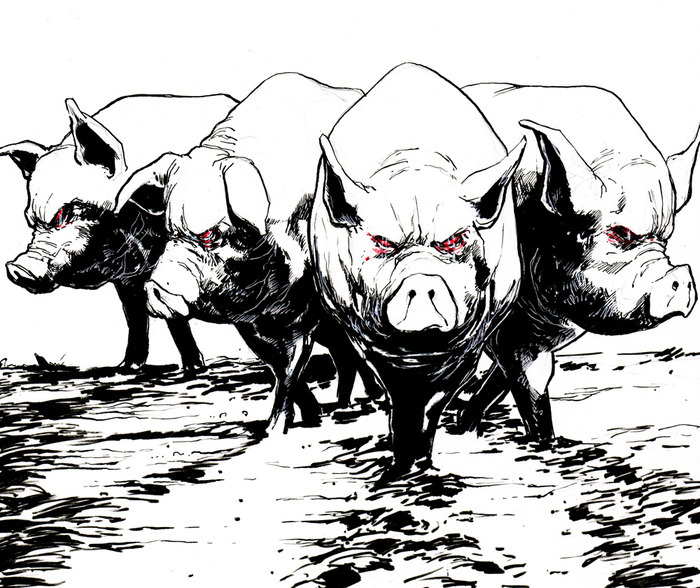 And – even more importantly – we’ll be launching Issue 1 of SENTIENT ZOMBIE SPACE PIGS. The finest comic featuring aliens, pigs, rednecks and television reporters to be published this year – and that’s a fact! We’ll also be revealing the winners of our recent Competition and doing some strange and wonderful magic on the bacon rolls available from the Assembly Hall caff. So don’t miss out. Melksham‘s a great little town, easily accessed from the M4, between Bristol and Swindon. Last year’s con was superb, and the line up this year is even better. See you on Saturday! And don’t forget to bring £1 for your copy of SENTIENT ZOMBIE SPACE PIGS! Don’t mess with the pigs! So some kind man called Tristan has posted a blog listing the 20 Best Movies Featuring Pigs. That’s the kind of blog we’re interested in here at Disconnected Press as we gear up for the launch of our next comic: Sentient Zombie Space Pigs. All a bit sweet, isn’t it?